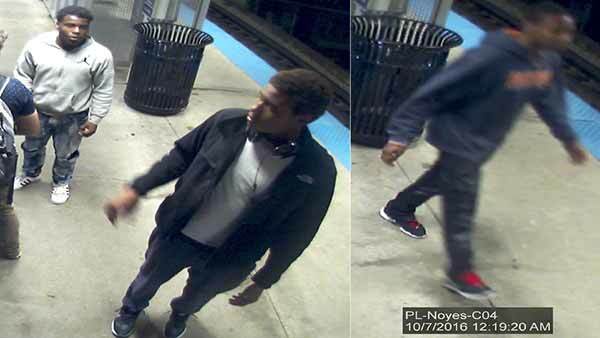 EVANSTON, Ill. -- Police in north suburban Evanston released photos Saturday of three people suspected of trying to rob two Northwestern University students - one of them successfully - early Friday near a Purple Line CTA station. Five other passengers walked up to a 21-year-old student on a northbound train near Main Street just after midnight and demanded his wallet and cellphone, according to Evanston police. The student refused and two suspects briefly followed him off the train at Noyes Street, but they ran away eastbound. Shortly after that, three people walked up to another student talking on a phone at Sheridan Road and Noyes, and they asked to use his phone, police said. When he refused, they took his phone and wallet, and forced him to take them to an ATM to withdraw $400. They then retuned his phone and wallet, and went back to the Noyes station, police said. Footer: Source: Sun-Times Media Wire - Copyright Chicago Sun-Times 2016.